An interval can be defined as the distance between 2 notes. 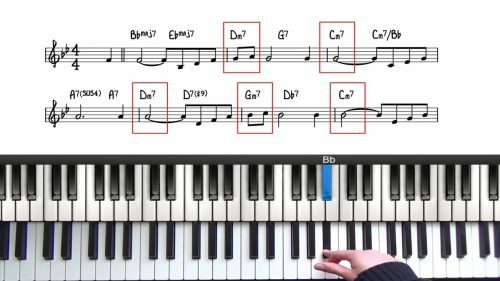 As a jazz pianist, you need to have a solid understanding of intervals so that you can build chords quickly and improvise freely on the piano. 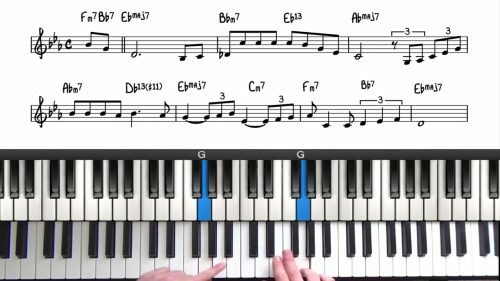 If you’re new to jazz piano, you might find this lesson quite technical so try not to get caught up in the theory. The main purpose of this lesson is to introduce you to the concept of intervals so that you are familiar with the interval names when covered in later lessons. What Are Intervals In Jazz Piano? All intervals contain a number and a prefix, the number tells you how big the interval is. In the C major scale, the interval from C to D contains 2 pitches — C & D which makes it a ‘2nd interval’. The interval from D to A contains 5 pitched — D, E, F, G & A — which makes this a ‘5th interval’. In order to work out interval names quickly, you need to understand the concept of half and whole steps. 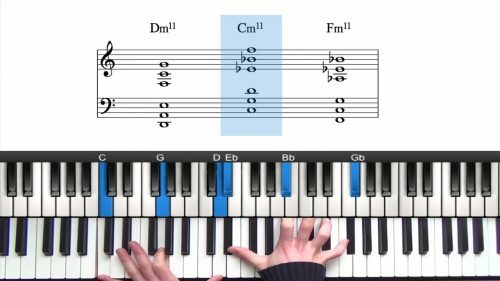 A ‘half step’ which is also known as a ‘semitone’ is where you play 2 adjacent keys on the piano. Examples include C — Db and E — F.
A ‘whole step’ which is also known as a ‘tone’ is made up of 2 half steps — so there is always a note in between. Examples include C — D and E — F#. All intervals can be measured in terms of whole and half steps so it’s important that you understand these two terms. The smallest of all intervals is the minor 2nd which is an interval of half a step. You will find minor 3nd intervals in close-position minor 9th voicings. The minor 2nd interval is in the middle of the chord. The major 2nd is an in interval of a whole step or 2 half steps. The major 2nd interval sounds slightly brighter that the minor 2nd but still has a dense and compact sound. An example of a major 2nd interval in a chord is a close position major 9th voicing. The minor and major 2nd intervals add dissonance to close position voicings and create a jazz sound. Next we have the minor 3rd and the major 3rd. The minor 3rd is an interval of 1 1/2 steps and the major 3rd is an interval of 4 half steps. Minor and major 3rds are the basic building block of triads, 7th chords and other extended chords. You will find them in minor triads, minor 7th chords and minor 9ths. And also in major triads, major 7th chords and major 9th chords. In the lesson on triads and 7th chords we look in more details at major and minor 3rds and how they are used to create these chords. The perfect 4th is an interval of 5 half steps. It’s called perfect because it’s neither minor or major. The perfect 4th is a very consonant sounding interval and it’s used extensively to create modern sounding 4th voicings. A common 4th based voicing is the So What Voicing. The perfect 5th is an interval of 3 1/2 steps — again it’s called perfect because it’s neither minor or major. The 5th is a unique interval because it can be played very low down on the piano without it sounding distorted. This makes it very handy for adding depth and weight to a chord. Some voicings are built exclusively of fifths, the most common which is the Kenny Barron Voicing. There is actually an interval between the perfect 4th and 5th which goes by 3 different names. The first name is the augmented 4th — you should look at this as a perfect 4th interval that have been raised by half a step. The second name is the diminished 5th — you should look at this as a perfect 5th that’s been lowered by half a step. The final name that is used to describe an interval of 3 whole steps is the tritone. The tritone is present in all dominant 7th chords. The tritone intervals gives the dominant chord it’s tense and unstable sound. Next we have the augmented 5th and the minor 6th — these two intervals are both 4 whole steps. You should look at the augmented 5th intervals as a perfect fifth that has been raised by half a step. It’s present in augmented triads and augmented 7th chords. The minor 6th is also an interval of 4 whole steps but you should look at it as a major 6th interval that has been lowered by half a step. The major 6th is an interval of 4 1/2 steps, what’s confusing about the major 6th is that it is used for both major 6th chord and also minor 6th chords. The major 7th is an interval of 5 1/2 steps and is uses to create major 7th chords. The last interval is the octave. The octave marks the next occurrence either higher or lower on the keyword. Make an effort to learn these interval names. This will happen naturally as you watch more lessons in the PianoGroove course as we are always referring to the interval names. At this stage, perhaps run through each interval name once a week to keep the information fresh in your memory.